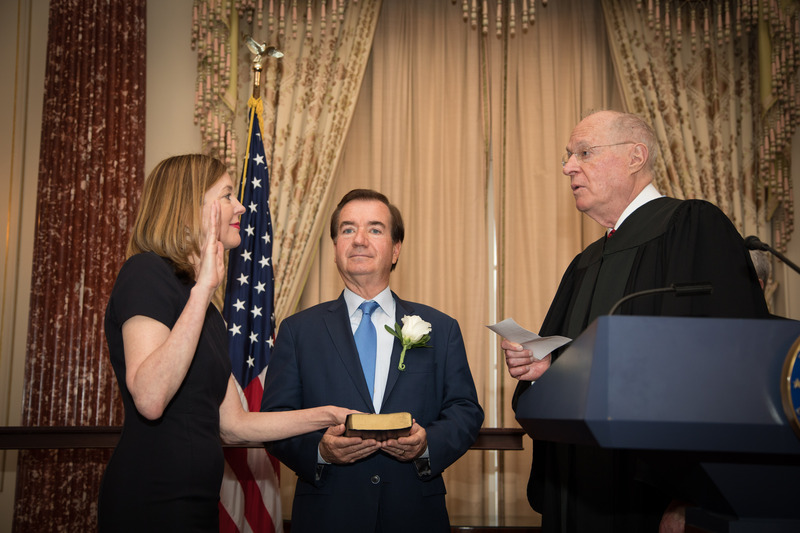 Marie Royce was sworn into office on May 9 at the U.S. Department of State. Deputy Secretary of State John J. Sullivan provided opening remarks, highlighting Royce’s background participating in and promoting international exchange programs. Associate Justice of the Supreme Court Anthony Kennedy administered the oath of office, and lifelong friend and priest Father Andrew Encinas delivered the invocation. Royce’s husband of 33 years, U.S. Representative Ed Royce, also participated in the swearing-in ceremony. At the ceremony, Deputy Secretary Sullivan relayed the confidence that he and Secretary of State Mike Pompeo have that Assistant Secretary Royce will strengthen the Department’s efforts to communicate and amplify the American story around world through exchanges. Assistant Secretary Royce oversees a wide range of programs that advance U.S. foreign policy objectives through educational, professional, cultural, and sports exchanges that promote mutual understanding between the people of the United States and people of other nations. State Department exchanges create networks and partnerships to advance U.S. foreign policy goals and address global challenges and opportunities. To learn more about Assistant Secretary Royce, read her bio in the "About the Assistant Secretary" section.